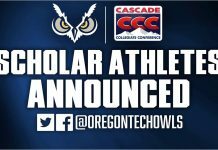 KLAMATH FALLS, Ore. – After taking both league counters from the Warriors on Saturday, the Owls got the third and final game behind the bat of Baylee Wyscaver as she hit an RBI walk-off single to left-field scoring Cierra Barkis with the game winner in the bottom of the seventh leading No.13 Oregon Tech (29-10, 15-3 CCC) past No.10 Corban University (22-11, 11-7 CCC) 6-5 Sunday at John and Lois Stilwell field. 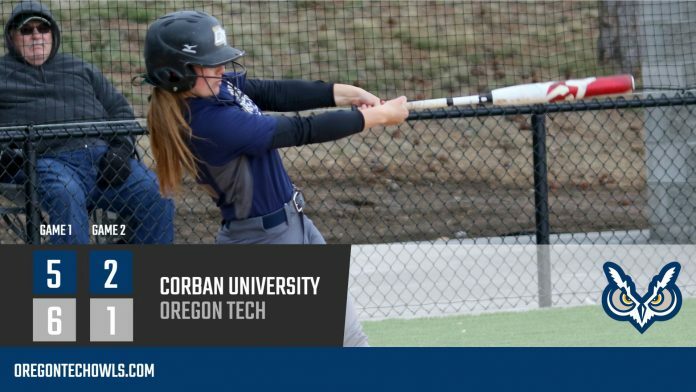 Corban picked-up a 2-1 victory ending the OIT win streak at 11. Kiahna Brown singled and scored the game’s first run in the bottom of the first. Corban took a 2-1 lead with two-hits in the top of the second, highlighted by a Sam Woodley lead-off double. 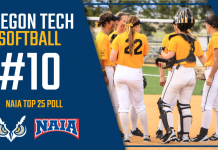 Tech scored an unearned run the second inning to tie the game at 2 then took the lead 3-2 in the third on a McKenna Armantrout (Pictured) RBI bunt single. Back came CRB after a walk to Jessie Isham, Woodley hammered her fourth homer of the year to left field giving the Warriors a 4-3 lead. That lead didn’t last long as the Owls tied it up in the bottom of the inning as Logan Nunes started the inning with a leadoff triple and scored on a Brown single. Tech went up 5-4 in the fifth with three-hits including a Nunes double. Corban’s Megan Rybar tied the game at five as she hit her fourth home run of the season in the top of the seventh. In the bottom of the final frame, Barkis started the game-winning rally with a lead-off walk. She was then bunted over to second base on a sacrifice from Armantrout and scored the game-winner on the single by Wyscaver. Sarah Abramson pitched the final four innings to pick up the win and improve to 13-4 on the year. Woodley had half of the Warriors hits with three while Makiah Johnson added two-hits in the loss. Brown had three-hits for the OIT with Ali Graham, Wyscaver, and Nunes chipping in two-hits apiece. Corban starting pitcher Sarah Probasco pitched a gem, spreading out seven-hits and holding the powerful OIT offense to just one run for the complete game win, improving to 10-3 on the year. Johnson gave the Warriors the early 1-0 lead with a solo homer in the top of the third. Corban made it 2-0 in the fourth with an unearned run. The Owls scratched across one-run in the 4th on a Shelby Hotchkiss RBI double but couldn’t muster any more offense as Corban held on for the 2-1 win. Johnson led Corban with three hits in win. Hotchkiss led the Owls with two of the teams six hits. 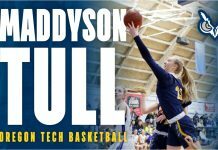 Oregon Tech will travel to Canada next weekend to take on British Columbia on Friday and Saturday before returning home for Senior weekend April 19 and 20 against College of Idaho.